It looks like DJ Khaled has secured another hit from the Toronto star for his upcoming Grateful album. DJ Khaled is in the midst of finalizing his upcoming Grateful album, executive produced by his six-month-old son Asahd, and the vocals are streaming in. 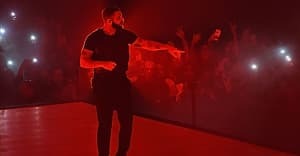 Khaled shared pictures and videos of a studio session with Drake on Tuesday night, repeating his common pre-album ask, tied to whichever collaborator is due up, "Did the Drake vocals come in?" It seems safe to say that the Drake vocals have been secured, and the duo are looking to recreate the success of their platinum-certified hit "For Free" from Khaled's 2016 Major Key album. In the Instagram clip, Drake says to the Khaled, "If I learned one thing from you when I was younger: Why give 'em one when you can give 'em another one."